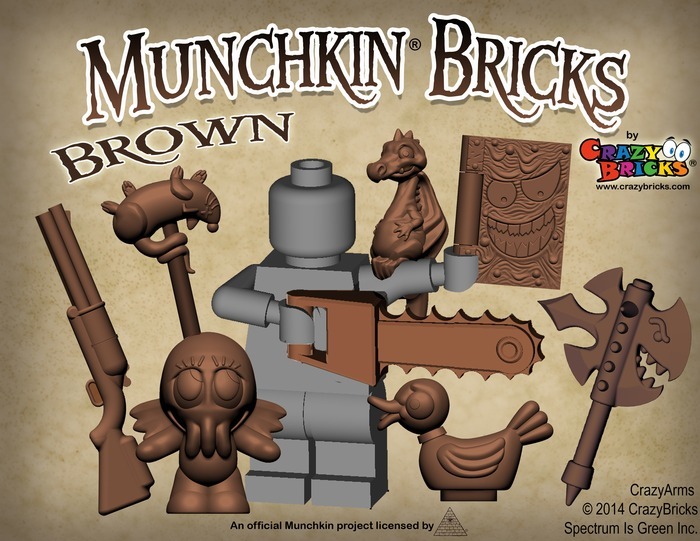 CrazyBricks is working with Steve Jackson Games to make 3D miniatures accessories of the Munchkinomicon, Chibithulhu, the Rat on the Stick, and other favorites from Munchkin. CrazyBricks has teamed up with Steve Jackson Games to produce officially licensed accessories for miniatures. The accessories are compatible with miniature figures such as LEGO, Kre-O, Kubrick, Character Building, Si-Dan, and Friends. 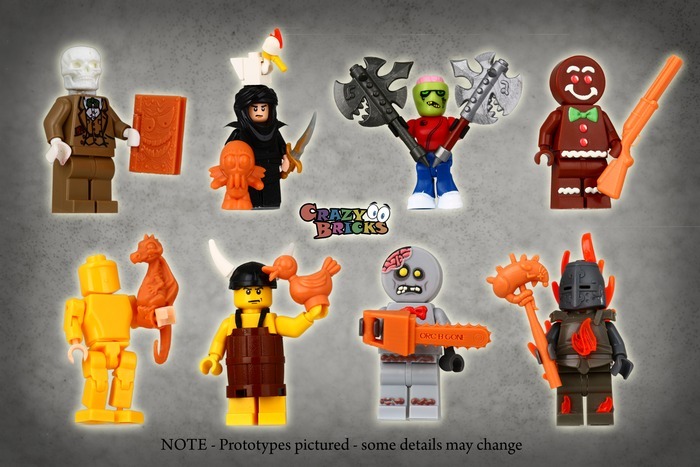 The injection molded figures are based on iconic items and weapons from the Munchkin card game. CrazyBricks launched a Kickstarter campaign today to produce the figures. The first set includes the Unnatural Axe, Rat on the Stick, the Triple-Barreled Shotgun, the Munchkinomicon, Chibithulhu, the Chainsaw of Bloody Dismemberment, the Cute Shoulder Dragon, and the Duck of DOOM! Each set also includes a Kickstarter-exclusive Munchkin card. CrazyBricks' funding goal is $15,000. On the first day, the campaign has raised over $4,000 from 147 backers. The campaign ends June 24. Prototype Munchkinomicon from CrazyBrick's Munchkin Bricks Kickstarter. Green accessories from CrazyBrick's Munchkin Bricks Kickstarter. Gunmetal grey accessories from CrazyBrick's Munchkin Bricks Kickstarter. Brown accessories from CrazyBrick's Munchkin Bricks Kickstarter. 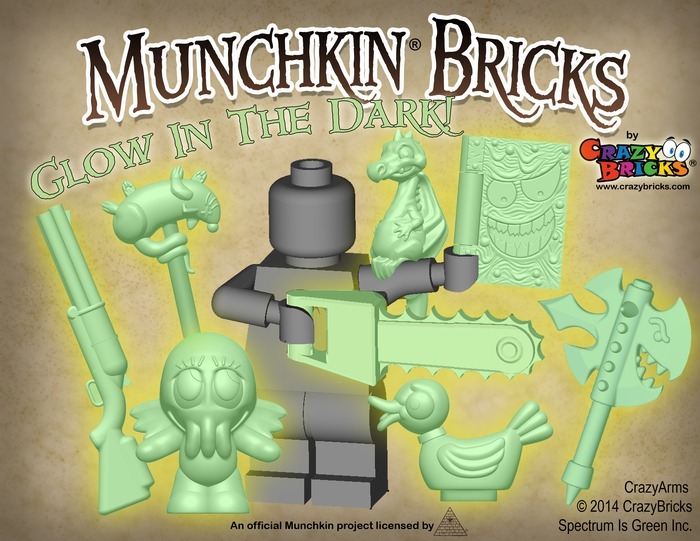 Glow in the Dark accessories from CrazyBrick's Munchkin Bricks Kickstarter. Prototypes for CrazyBrick's Munchkin Bricks Kickstarter. Each set of miniature accessories will come in one of four colors. The four colors currently planned are gunmetal grey, brown, green, and glow-in-the-dark. A fifth color option will be added if the campaign hits a stretch goal of $35,000. Other stretch goals at the $20,000, $25,000, and $30,000 milestones will unlock additional items and multi-color add-on collections of Chibithulu, the Duck of DOOM!, and the Cute Shoulder Dragon. Backers can also receive a Munchkin-styled crate for storing their accessories, starting at the $25 backer pledge level. CrazyBricks manufactures accessories and custom parts for miniature figures. Existing products include skull heads in many colors, gingerbread man and the zombified gingerdead man figures, pig-men faces, and other accessories. The Munchkin Bricks project is the third Kickstarter project run by CrazyBricks. Alright, given how financially successful Munchkin has been, WHY do they need a Kickstarter at all? This smells fishy at its core, and this sure didn't need a Kickstarter to get off the ground. From their explanation, injection molding is expensive. I would have loved some of those back when I was building Stikfas characters on a regular basis. But I think Stikfas is dead now, or at the very least they're no longer in any kind of production. So? They've made plenty of money off the game. I seriously doubt the amount of money they are asking for is above what they have available to them. A) Because the people responsible for the kickstarter are not Steve Jackson Games, they are working "with" them, which is probably just a way of saying they got permission to make official licensed Munchkin stuff. C) The massive cost of getting moulds and casting setup, if they just chucked a shitload of money into this kind of project without gauging interest they could end up in a shitload of financial trouble. Or to put it more simply, they exist to make money, not spend it, so if they have a way to avoid doing so, of course they'll use it. There is nothing "fishy" about this. Even if it were to turn out that there was something off about it, you can bet that Steve Jackson Games would have it shut down well before the June 24th closing date. You don't have to "need" kickstarter to recognise its use and use it to your advantage. This way they tell people their idea, people tell them if they want it by pledging money up front. The company can make the product using the money pledged instead of drawing from their reserves and in return the backers get a good deal/exclusive items etc. Its just good business sense, which unusually doesn't hurt the customer. The ever present risk is that something goes wrong and backers can't get their rewards, but it is far less likely when a larger company is involved as they will generally help things along to avoid taking a hit to their reputation. Even so, it is the risk you take when using kickstarter.